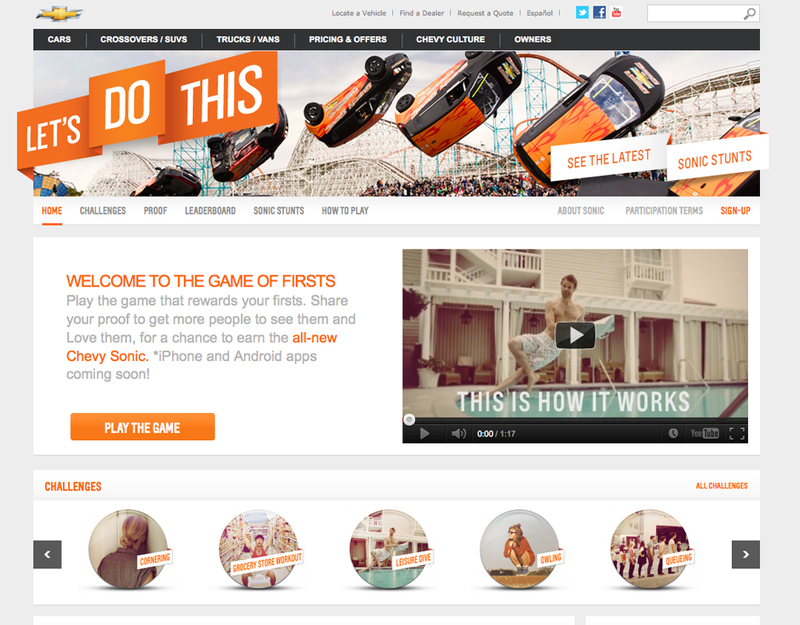 General Motors is running “Let’s Do This”, a stunt-filled integrated advertising campaign featuring the 2012 Chevy Sonic. Commercials timed to coincide with the 2012 Super Bowl feature skydiving, bungee jumping, kick flipping, and OK GO, all pointing to the campaign that’s been built up at letsdothis.com. Song is we﻿ are young by Fun ft.Janelle Monáe. The Chevy Sonic Stunts campaign was developed at Goodby Silverstein & Partners by associate creative director Andrew Bancroft, creative director Joakim Borgstrom, associate creative director Niklas Lilja, art director Javier Torok, copywriter Damian Fitzgerald, broadcast producer Dan Watson and senior interactive producer Eric Shamlin. Filming for the Stunts ad was shot by director Adam Sadowsky via Motion Theory with executive producers Javier Jimenez, Patrick Nugent, producer Buddy Enright and director of photography Kurt Stevens. The Sonic Bungee project was produced at Syyn Labs by creative director Hector Alvarez, lead engineers Dan Busby and David Mesloh, lead fabricator Kenny Abney, key rigging grip Rick Rader, fabricators Davis Galligan, Chris Stockton, David Paris, Matt Samsel, Will Reeve and Mike Russek, engineer Sam Leventer, assistant engineer Donovan McLean, production coordinator Gilles d’Amecourt. The Syyn Labs team spent a week building the tower structure starting with approximately 80,000 pounds of ballast at the bottom over a steel support deck. The shipping containers were stacked, aligned with pins and chained together—wider at the bottom to provide strong support. The structure is topped with a second steel deck and custom-made rail system allows the car to slide without any friction. The rail system was welded onto the length of a 53-foot run, cantilevered 50 feet out over the edge of the tower so that prior to dropping, it will appear as if the Sonic is floating in mid-air. Positioned near the car on the upper deck is a large finger pointer sign mimicking a computer’s cursor. This sign will light up as fans click on the Chevy Sonic site driving software, in turn, triggering a custom-designed gear system that will move the car slowly forward. The gear system runs on a one-horsepower motor to move 14 interlocking handmade, toothed gears (some weighing over 100 pounds each) that will slowly inch the car forward out on the rails. Several cameras placed around the tower will offer several birds-eye-view vantage points of the stunt live via www.letsdothis.com. When enough clicks have driven the car across the platform and the car is teetering on the edge, someone’s final click will set the bungee adventure in motion.